Agile has arrived: What now for me as an architect? Agile has arrived: What now for me as a DBA? We don’t take success for granted. We use agile techniques to make success happen. Off the shelf software seems to be the answer, but it won’t always do exactly what you want. Besides, many of the same issues arise when the software has to be customized for your business. But what if what you heard isn’t always true? What if there was a way you could develop your requirements as the software code is developed, actually see and operate the software as it’s created, and change your requirements without busting your budget? There is such a way: agile software development, and CC Pace has been doing it since 1999, from the very birth of the agile movement. 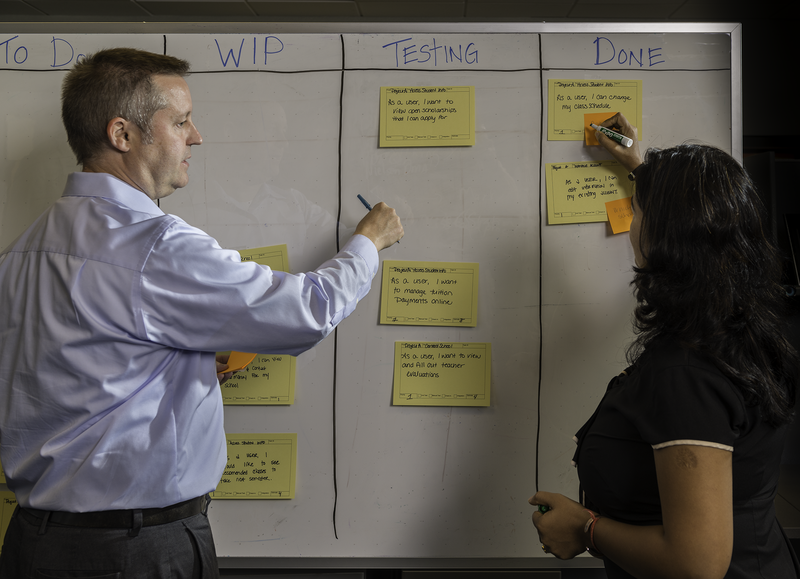 Using agile methods, we’ve successfully delivered every single custom software development project we’ve taken on. 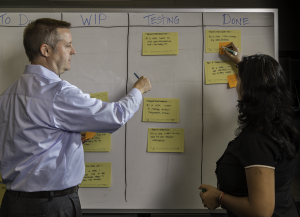 Agile techniques focus on repeatedly developing small, high-quality, working pieces of an application in quick succession. How quick? CC Pace can deliver these pieces as often as every week. After each short development cycle completes, you can operate the part of the application we’ve developed so far. Give us your feedback based on what you observe, and we’ll incorporate that feedback in the development of our next small piece of the application. This process continues until the system has grown to meet your needs. That’s the beauty of agile—you get to see the system take shape before your eyes. You can offer continuous feedback. You can see how your budget is being spent. In short, you’re in the driver’s seat, steering the product to your vision. We also use engineering techniques that allow us to greatly lower the cost of changing the software. So if your requirements change because your competitors are on the move, go ahead and ask for changes. We think you’ll be surprised how quickly we can respond. Is budget an issue? Grow the system to minimum viable product, then put it in production and let it start generating revenue for you. We use agile engineering techniques to minimize the pain of going to production, so you can release early, self-fund future development, and constantly release new and better versions of your software. Intrigued? Contact us. Let us show you why we have a 100% success rate with custom application development.